Present were Robert Garner, Ron Williams, Bill Flora , Ed Thelen. The newly connected 18 KVA Pacific Power was carefully examined for input transformer taps. (The taps used by IBM were satisfactory for our power also.) The output power tap selection was calculated and set. 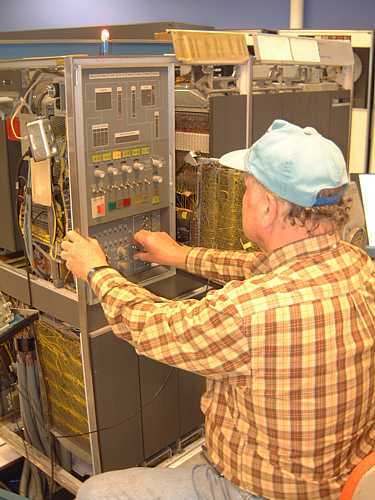 Ron Williams removed various jumpers and a switch used to cheat to get the system to come up with the 5 KVA Elgar unit. The Pacific Power was gingerly brought up following instructions in the manual. Pressing the "OUTPUT ON" brought voltage to the 1402 :-)) Adjusting the master voltage screw brought the 3 phase output voltages to 220, with a little fine tweaking on the two fine phase adjustments. There was some excitement about voltages after power was applied to the 1401, but that turned out to be a measurement error, not a power error. And we accidentally even had the phases in the correct sequence, the motor was turning in the correct direction. The 1401 takes about 1/3 of the rated capacity of the Pacific Power !! We think we have lots to spare - even some extra to start motors with !! We seem to have victory over the power situation that has been plaguing us for the past 6 months. April 6th - Don Cull working a stubborn card sense problem. The meters are into the timing circuits. And note Milt Thomas and Ron Williams in the 1406 extended memory. Before today, this memory had to be disconnected to get the 1401 up or the Elgar would trip OFF. April 6th - Founder of the Feast !! This Pacific Power 390G 50 Hz supply has more than three times the power of the previous Elgar. The 1401, 1402, 1403 and 1406 running concurrently uses about half of its capability :-)) Previously only one unit at a time could be usefully on, and we couldn't even start the 1403 printer motor. We *have* victory over the power situation that has been plaguing us for the past 6 months. The new Pacific Power unit has sufficient power. Present were Ron Williams, Frank King, Don Cull, Milt Thomas, Robert Garner and Ed Thelen. Life was *GOOD*. 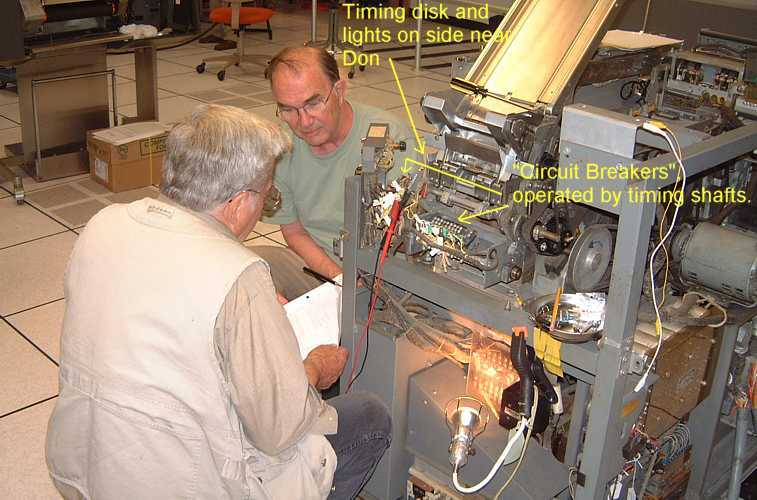 Don and Milt were running the 1402 card reader motor - working a card sense problem. Joy of joys, we now seem to have solid 50-Hz power! Murphy was asleep this week as everything went smoothly with the bring-up of the Pacific Power 18-kVA power converter (recently acquired from an IBM San Jose surplus property bid). 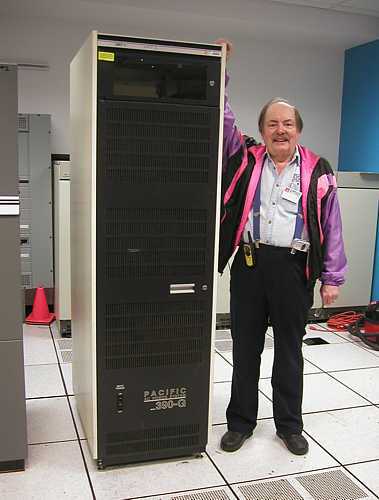 Dave, Gary - Thanks for recommending the unit to us, shepherding it during its last months at IBM San Jose, making the Museum aware that we could bid on it, and providing documentation, technical support, & Pacific Power contact information. You guys were right - it's a great product! Mitchel (@Pacific Power) - Thanks for answering our questions, we really appreciate the support! Your unit is still pulling fine after 30 years! Mike F - Thanks for the care and feeding of the IBM bid process! Mike Z (@Exhibit Oasis) - Thanks for moving and installing the unit! Grant - Thanks for supporting our decision to bid on the static converter. for a total of 5.7 kVA. 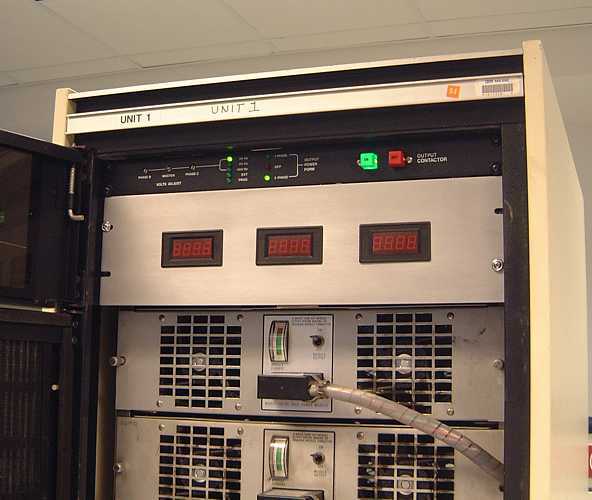 (The 1401 specs list this configuration at 4.9 kVA.). No 729 in the mix yet. 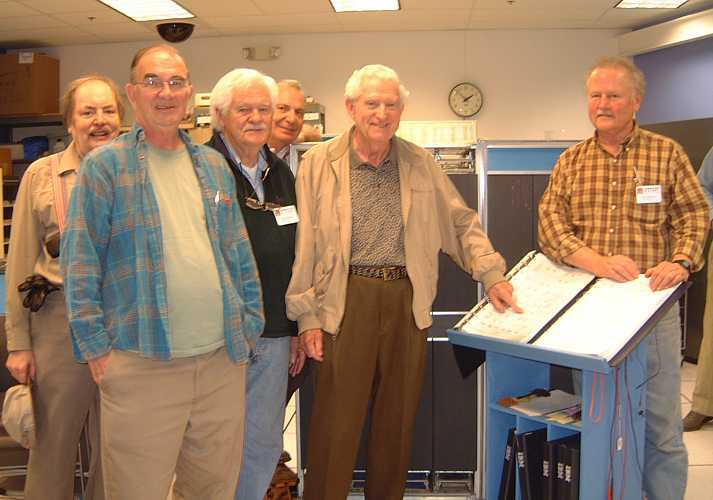 Present were Ron Williams, Robert Garner, Tim Coslet, Bill Worthington, Bill Selmeier, Rafael Skodlar, Ed Thelen - and Brian Knittle with his Documation card reader. Ron Williams found 2 more bad cards in the 1401 while starting to check instruction (program) counter logic. 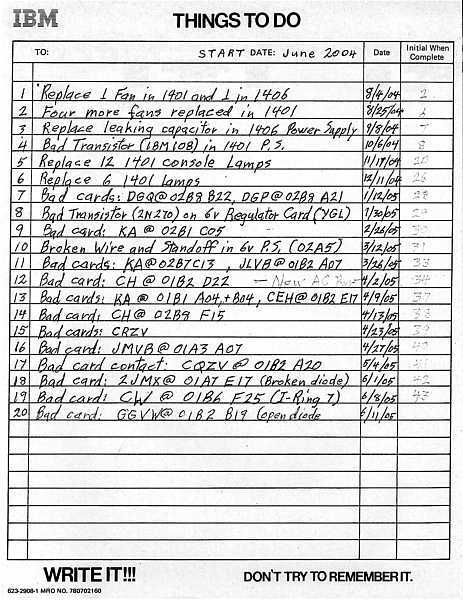 Bill Selmeier used his laptop and Brian's card reader and control program to read many 1401 oriented IBM card decks. Bill Worthington fanned, joggled and manipulated the cards and Ed Thelen recorded. See report. Bill Selmeier's report did not mention that we input "Edith" - a moderately "naughty" (for 1960 IBM) printer program. Ed noticed that neon lights glowed in 4 of the 9 Pacific Power power amplifiers. A glowing neon indicates one or more of the 20 or so fuses in each glowing power amplifier has blown. Robert, Rafael, and Ed swapped out the glowing units with power amplifiers from the slave unit in storage. Hot swapping does indeed work ;-)) Paula of the staff blessed the swap. Tim found an apparently shorted punch bail interposer contact in a key punch. Lotsa power, lotsa folks, lotsa work :-)) In attendance were Ron Williams, Bob Erickson, Don Cull, Chuck Kantmann, Robert Garner, Grant Saviers, Ed Thelen, Milt Thomas, Ron Mak, Bill Selmeier, Allen Palmer, Bill Worthington, Frank King and ?? Bill Selmeier, Ron Mak and Bill Worthington read cards using Brian Knittle's card reader. See report. In the Pacific Power 390G - we are in the process of blocking the recirculation path of some of the warmed air back to the cool air input side - the inlet air temperature to the top power amplifier is noticeably warmer than to the others. The phase currents to the 1401 are very unbalanced. Exhaust air from phase A and B power amplifiers is noticeably warmer than the C phase power amplifiers. Wednesday April 20th - 10 AM - Roll up sleeves - We had Ron Williams, Bob Erickson, Don Cull, Robert Garner, Allen Palmer and Ed Thelen. 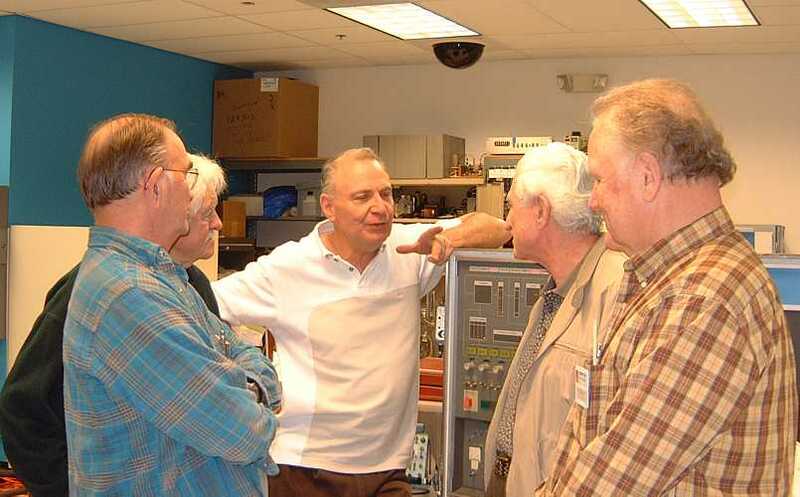 We received a surprise visit from Gene Amdahl, designer of WISC, project engineer of IBM 701, an architect of the IBM 360 series, and founder of Amdahl Computer Company with Amdahl V-470 :-)). Bob Erickson worked for Gene for a few weeks on the IBM 701 project. 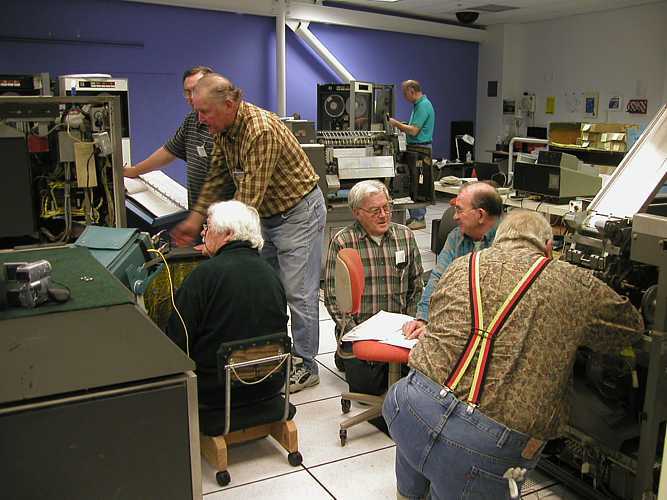 Bob had finished 701 CE school class #6 but the Los Alamos computer was not yet ready. While waiting the few weeks for Los Alamos, Bob was assigned by Gene to see if Bob could fit an index register into a specified volume of the 701 main frame. [Bob says the 701 was behind a wall of glass - to get to the computer you had to leave that area to get to the proper door to get near the computer.] 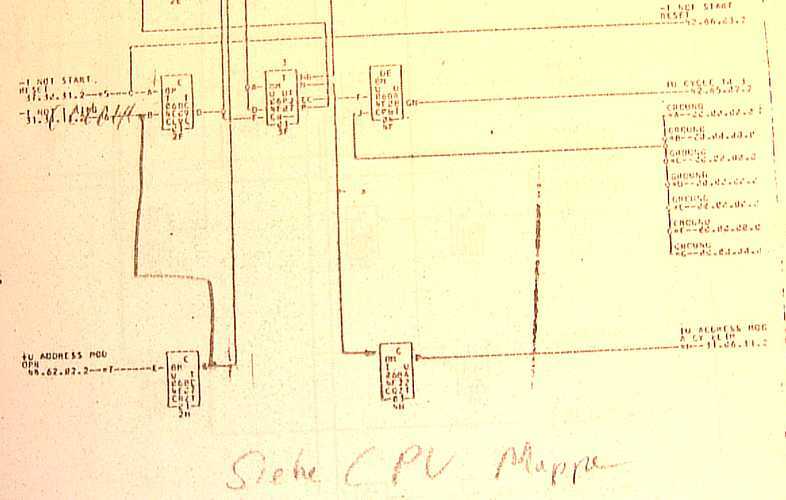 Gene reminded us that the 704 was the first computer with true index registers - the British "B Box" was simply a counter indexable by only one. Harlan Snyder (a docent at CHM) worked for Gene in Palo Alto at IBM's Advanced Research something. 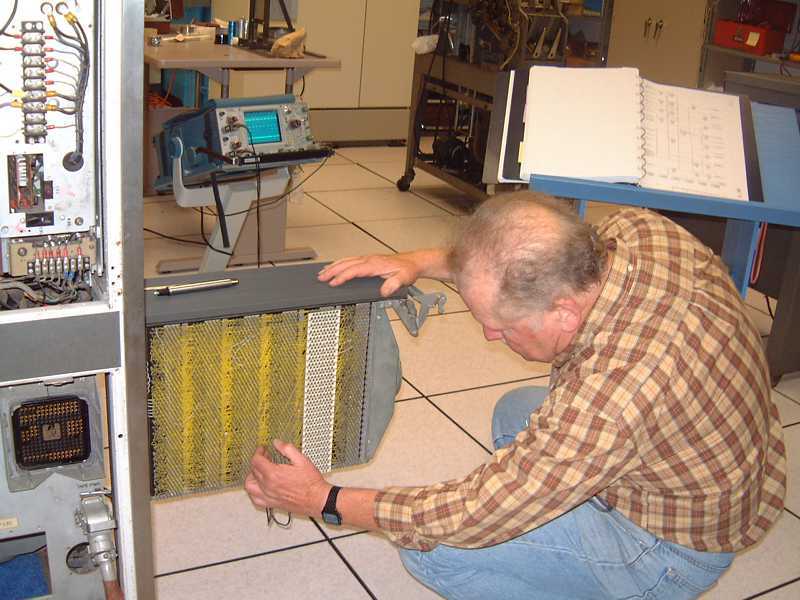 In a previous life, Harlan had worked with the ERA ATLAS computer. Dag gave permission to swap the CBs (see picture above). But by the time Chris & company got done discussing wire tagging ... it was 2:30 and the tours were on. Robert brought in 3 LED voltage displays to show 3 phase voltage outputs of the Pacific Power. Ron is cutting 3 square holes for mounting and Ed will supply a flexible input 5 volt output power supply. We asked Dag for say 5 boxes of IBM cards. He said that there is a whole pallet in our warehouse in NASA. A few weeks? We had Ron Williams, Tim Coslet and Ed Thelen. I guess cup cakes just don't attract - Betsy Toole must bring brownies!! ;-)) Interesting day. 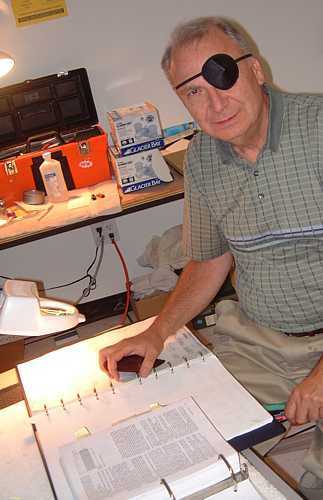 Ron had cut square holes for three LED voltmeters in the panel that Robert bought. 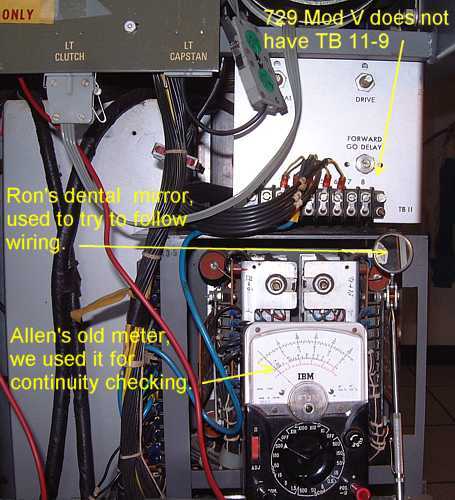 Tim used his in-circuit tester to examine printed circuit boards that Ron had identified as bad. There were so many bad components that one wonders what is going on. On one board, all seven input diodes were open, another board had two bad transistors and a resistor that was 16 ohms instead of 43 ohms. 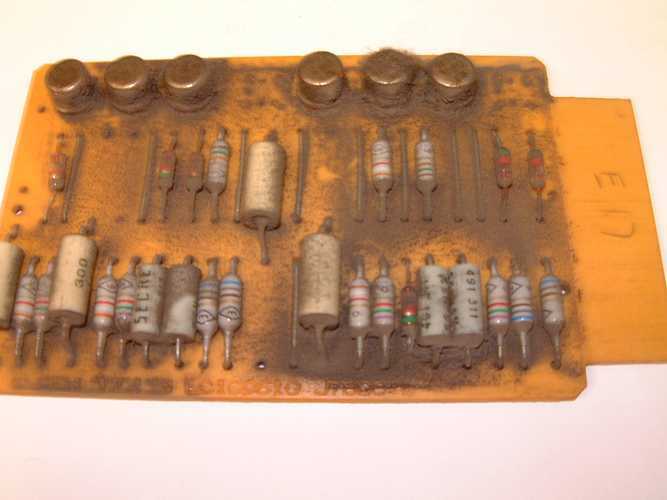 On several boards, the 56 microhenry peaking coils were open. Ron found 4 more bad boards. Ed went to a boy's toy store (Halted) and got 30 1N87A germanium diodes for Tim, and a 110/240 volt to 5 volt power supply for the panel meters (above). We looked up in Jameco and Digitek for additional parts like sockets and terminal strips. what is this thing trying to tell me? Ron Williams, Allen Palmer, Don Cull and Ed Thelen were present. Ron found more bad boards in the 1401. Ed removed bad components (as determined by Tim and his in-circuit tester), and installed replacement components from 4 printed circuit cards. One card had 4 bad transistors, another had 6 bad diodes. There is some question if/why such massive failures. Allen took apart a 729 "PROLAY". This is the magnetic unit that operates the 729's pinch roller to move or stop tape. He is currently looking for a source of AeroShell 14 lubricant - as specified in the manual. Ron Williams, Allen Palmer, Bob Erickson and Ed Thelen were present. Ron and Don found more bad boards in the 1401. Still having problems accessing memory from the front panel - did better last month. We have a box of printer paper to play with :-)) Can get delivery in one day from Office Depot. Ed removed bad components (as determined previously by Tim and his in-circuit tester), and installed replacement components from 3 printed circuit cards. 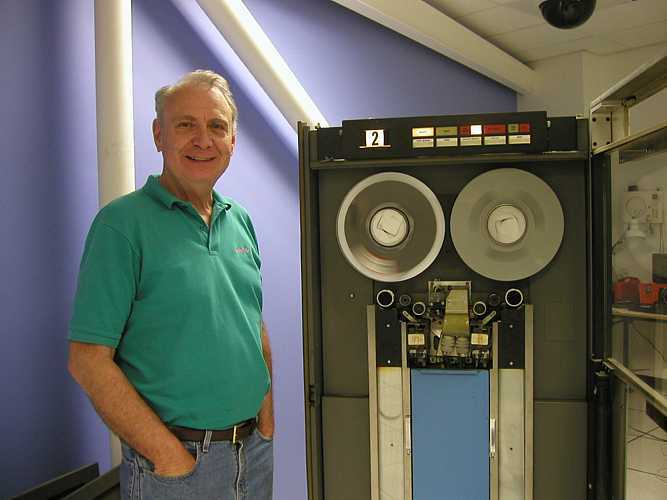 Lets see - Ron Williams, Allen Palmer, Bob Erickson, Frank King, Don Cull worked on the the 1401 and 1406 memory access, 1402 reader punch, and 729 tape units. Robert Garner (back from Yorktown Heights) checked in and delivered the baggles for lunch. 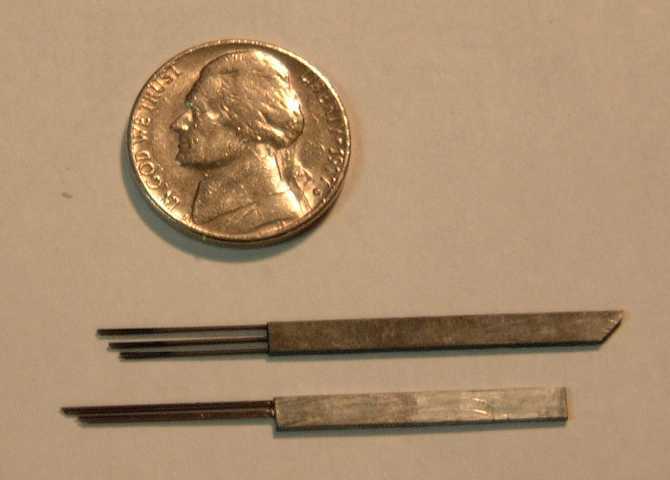 Grant Saviers delivered 4 tiny screws he made for Allen's 729 tape units that a machine shop said would have cost - was it $50 each? Great to have a resident machinist. Yes that is a penny in the background - notice the odd shaped heads, extended shoulders, and sharply butted threads. Now if we could have a drill press in the museum? The 077 collator that Bob Erickson is restoring had a makeshift electronic power supply instead of the original 48 volt motorgenerator. I forgot to form the capacitor in that makeshift power supply - and it got hot, ozzed and charred. A trip a "boy's toy store", HSC Electronic Supply, or Surplus Solutions, will provide a replacement. Bill Selmeier, Randy Neff and Ed Thelen stripped hardened rubber bands off of IBM cards - some of the rubber bands glued 2 decks together, and some flowed through holes - sticking more cards together and creating a new kind of hanging chad - , collected all the "meta-data" possible (what the heck is this deck? any clues? ), read and verified 3 boxes of cards (78 decks) onto CD ROM. Some of the "decks" were 1 card. I know that doesn't sound like much - but after 5 hours we were really tired. We have 9 more boxes in this batch. Ron Williams, Tim Coslett and Ed Thelen attended. Ron continued to trouble shoot the 1401. A widely distributed clock pulse has a good rise time but a very slow fall time. Tim tested the source board - seemed OK. Tried several replacement cards. Chased the load paths - nothing dramatic, found an obvious error in the ALDs - there is no zero board. Decided to live with it for a while Alex, what is this? 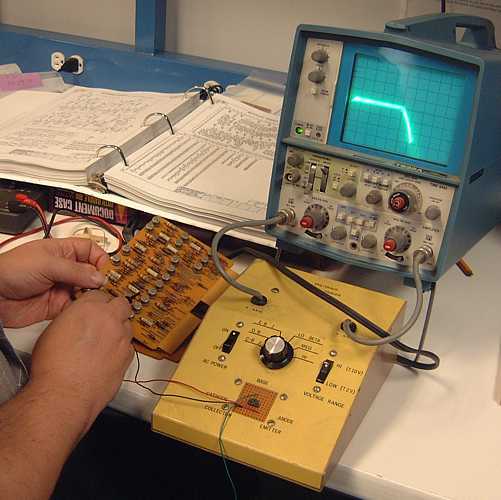 Tim Coslett continued to trouble shoot boards with his in-circuit tester. He replaced components in a number of boards. Must remember to get some more 56 microhenry inductors - would you believe more than two were open? Ed brought in six 026/029 keypunch printer ribbons. After installation in the 026, we found maybe half of the print matrix wires are not printing. Is this a lubrication problem? Bob Erickson - HELP. Replaced the sick capacitor in the juryrigged power supply for the 077 collator - then found the output current limiting circuitbreaker bypassed - Tim helped restore to what appears to be originally intended wiring. Power supply rated at 2 amps - does the 077 take more and that is why the breaker was bypassed?? The input fuse holder was found broken and also bypassed. We should install a good one. Wild!! More progress on the 1401 Cards was made today. Randy Neff and I spent 5 hours and read an awesome 5 of the remaining 9 boxes of cards. As we've said before, we see the light at the end of the tunnel. The cards are being read in Binary using Brian Knittel's agile card reader. 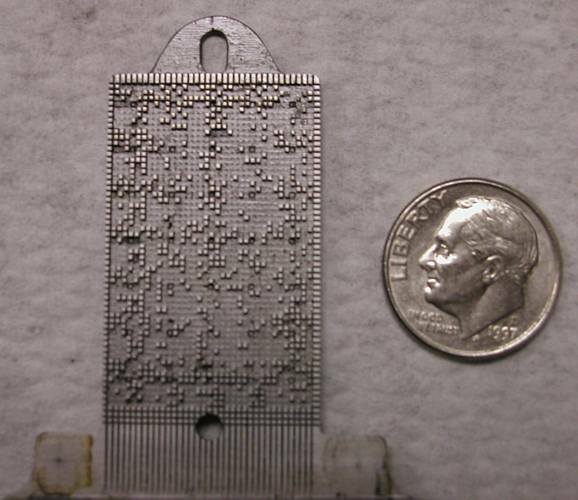 The card stock today was in better shape than we encountered in our earlier work on the cards that came with the IBM 1401. Except for problems with rubber bands that had deteriorated over the years. These cards appear to have originated in the 1975 time period. While the major portion applies to 1401 Emulators on S/360 and Burroughs computers, there are also program that appear to be doing financial activities. Al, 4 more boxes to go and you can have them to return. Randy and I have tentatively set aside this Friday to continue and hopefully finish the task. 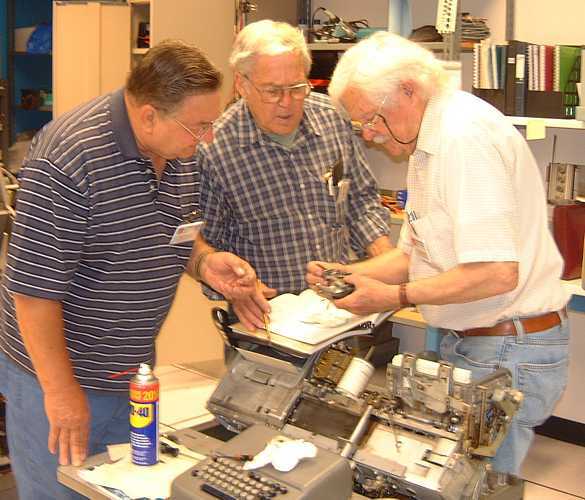 - I bought a can of WD-40 and Bob went after the faulty print head of the 026 keypunch. He found an opening to the print wire matrix and in went the WD-40. After 2 round of "lubrication" and testing, most of the printed characters were mostly recognizable, but badly flawed by missing dots. - Time for heroism - Bob had previously stated that he didn't want to work on the print mechanism - but desperate measures were needed. Bob said that he had taken one apart many years ago - but didn't get it back together - Bob and Milt removed the print head mechanism. 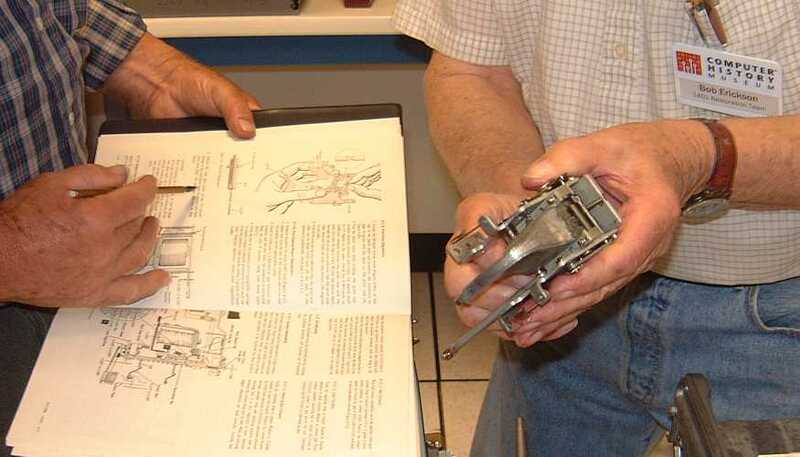 The question came up on how did IBM manufacture the print head for the IN\BM 026. The attached picture gives a big clue. All but one side is an aluminum casting The wires are fed down from the top to holes at the bottom. Then a low melting point metal was pored into the casting. Evedently, the wires did not bind to the metal. Clever people at IBM. Sombody at the 6800 group meeting suggested this last week. Whoever that was, feel good that you were right. The picture is 400 pixels per inch so you can magnify further to see more datails. 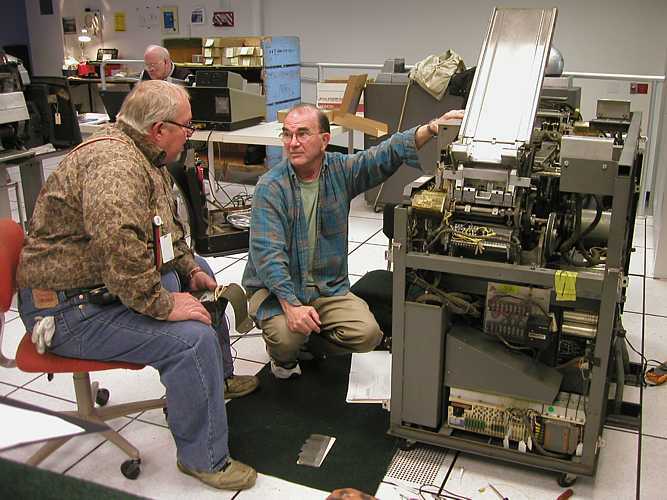 The code plate that causes the printing wires to press the ribbon and punched card are discussed on pages 4-25 & 4-27 of 029 Field Engineering Maintenance Manual (4 megabytes). - Ron and Frank worked on the 1401. 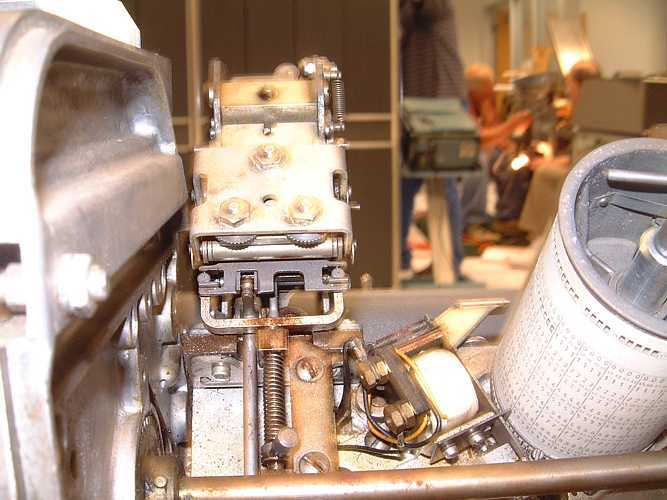 - Don and Chuck replaced six of the timing breakers on the read side of the 1402, and re-timed them. 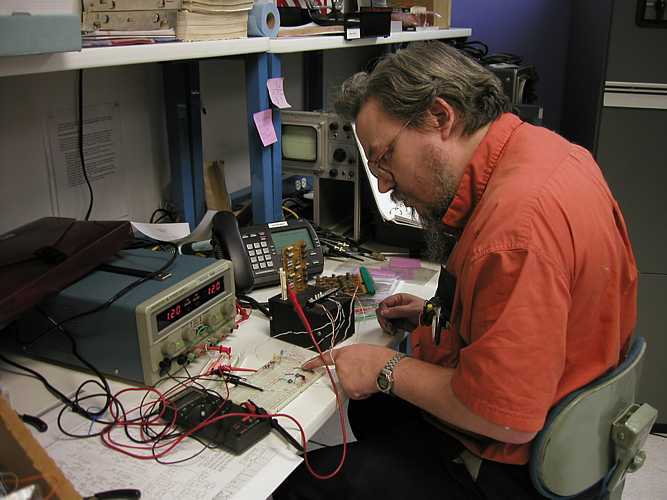 - Tim brought in his scope and in-circuit tester and went after some of the defective SMS cards. I am attaching a photo of page 66 from my IBM General CE Tools Reference Summary form number S131-0075-3. 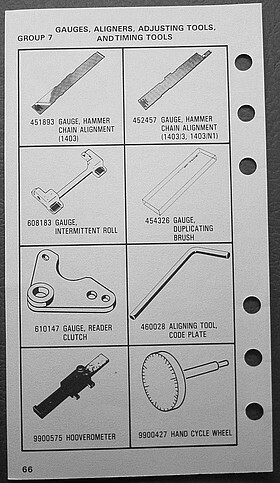 It has a picture of the alignment tool and part number. It was nothing more than small rod with a bent end to use as a handle. 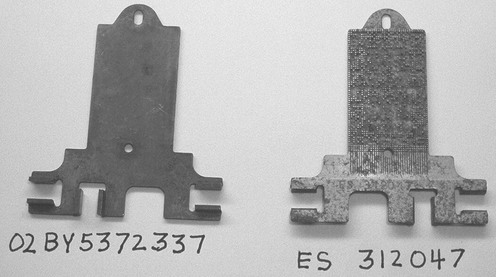 The hole in the code plate is the size of a number 41 drill bit. Any rod this size could be used. 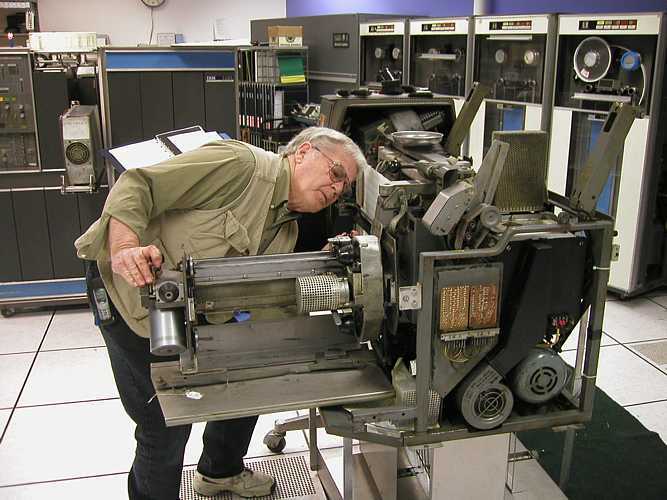 It was used as the starting point for mechanical adjustment of the print unit. If it was not used you could run out of movement in one direction when printing. There is an alignment tool in my toolbox on the desk. Look in one of the plastic boxes. I showed it to the guys about 2 weeks ago. It looks just like to picture John sent you. You insert it through the hole in the casing frame, through the print plate and align the plate & secure the plate. Just remember to remove the tool before you try printing. Wednesday May 25th - 10 AM - "All Hands Meeting" - Boole Conf Rm. - Robert is writing a report. Present were Ron Williams, Glen Lea, Frank King, Robert Garner, Ed Thelen. We showed people around then Ron trouble shot the 1401, "assisted?" by Ed. 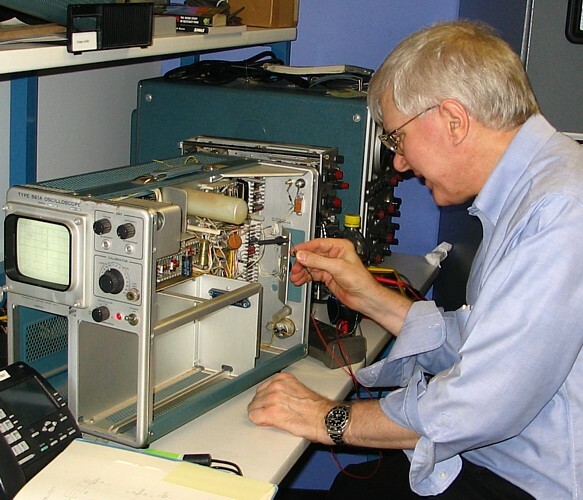 Harlan Snyder is bringing his microscope this Saturday to look for failure modes of the point contact diodes that are failing. 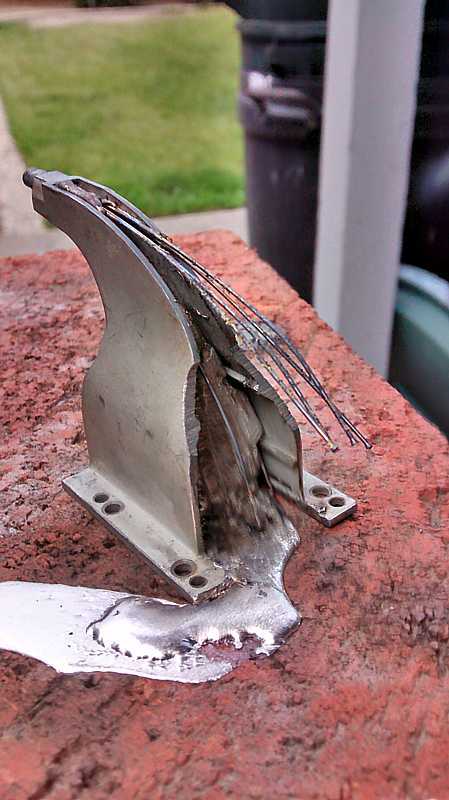 Robert took one of the failed 56 uHenry coils to his work place to try to analyze why a coil of wire can fail. We asked permission to swap some type AHD SMS cards with the Visible Storage 1401 and were turned down. We have to wait for Tim to repair some more AHD's. Present were Ron Williams, Tim Coslett, LaFarr Stuart, Harlan Snyder, Ed Thelen. Ron continued to trouble shoot the 1401. Tim repaired defective cards. Harlan brought his microscope to view failed diodes- but the noise, vibration, desk height, were not helpful. He took some failed diodes home for visual analysis in a better environment. Present were Ron Williams, Frank King, Allen Palmer, Ed Thelen, Robert Garner. Allen is back from Florida - we believe he went there to avoid the May 25th "All Hands" meeting ;-)) The group talked some about the future of the 1401 - especially "living presentation" and continuing maintenance. Frank is having trouble with a fuse blowing when powering up the 1403 when connected to the printer buffer controller. We don't have prints of the printer buffer controller so Frank wanted to compare a resistance value between 2 pins in the Restoration 1401 with the Visible Storage 1401. The -60V, 3/4 A Fuses that supply the 1403's core-memory line buffer, physically located in the 1401 CPU, have been consistently blowing. Frank had measured 10 ohms between the two core-memory -60V supply lines and ground, clearly far too low. 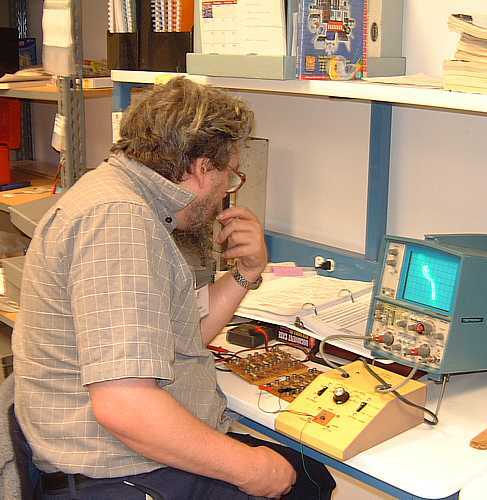 He measured 10 ohms and 60 ohms on the 1401 in visible storage. On Robert's suggestion, he disconnected all other supply wires connected to the 1401 logic gate (card cage). This resulted in about an acceptable 1k ohm of resistance when the +6V supply line was disconnected. Implication is a short to a +6V-powered component? 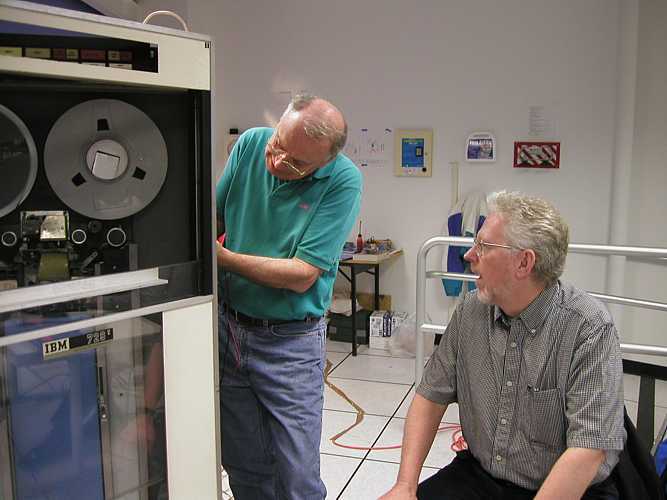 Allen used Krazy Glue to adhere some delaminated tape drive PROLAY MuMetal shielding. 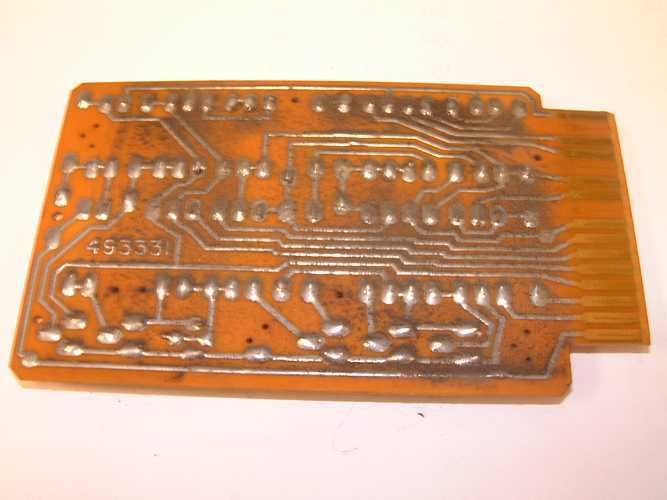 Ron found another bad card in the 1401- a diode on the card had part of it's glass envelope broken off. Ed and Robert vacuumed the dust and crud from the SMS cards in one logic gate (card cage). Crud was thickest inline with the fan. We resolved to clean one gate per session. 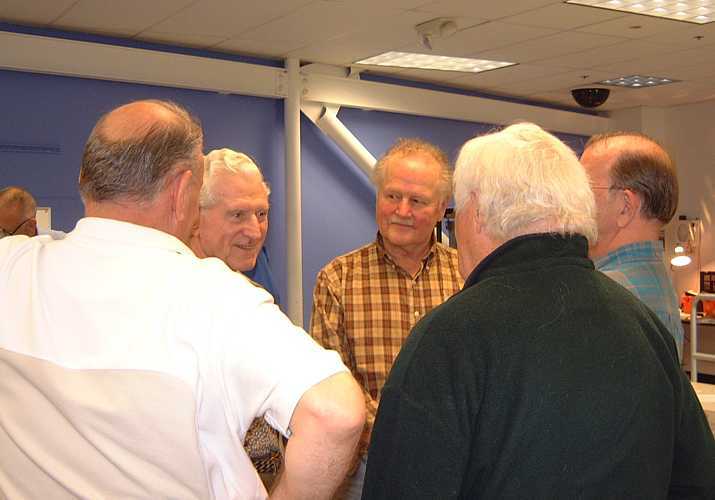 Present - Ron Williams, Don Cull, Frank King, Allen Palmer, Ed Thelen. Don and Frank working on the 1402 card reader/punch timing the 15 or so reader "Circuit Breakers" (mechanical contact points of the same idea as old fashion car ignition points). Ron was on his knees most of the time - I'm not sure which good luck charm he is begging favors from this time - maybe VOODOO this/next time? Ron made the low chairs and kneeling pads we use, but he doesn't use them - saying that his knees are already shot. Our 729 alignment procedures are for the Mod 4, and mentioned changing a 50 watt potentiometer until 4 volts is measured on TB11 across terminals 8 and 9 - two big 2 ohm resistors in parallel. The Mod 5 TB-11 has only 8 terminals. The schematics seem to be for a different revision Mod 5. We tried to chase wiring for three house, but trying to remove some of the chassis without disturbing other chassis too much got tiresome. We measured all combinations of voltages on the 8 terminals of TB-11 and did not find any within 25% of 4 volts- so we started physical adjustment of the rebuilt PROLAYs. Like what would you do? Maybe it will work anyway. Ron William's log of failed components so far (44 subtotal). 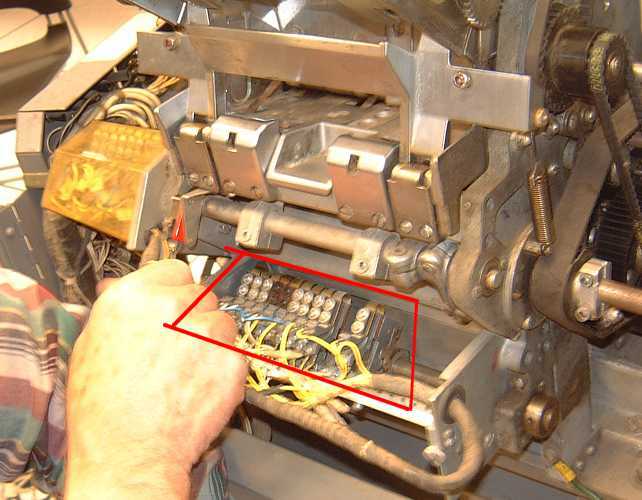 Dave and Ed checked out the indicator lamps in the printer alarm panel to the lower right of the ribbon assembly. 3 of the 8 were bad and another had a lose wire. 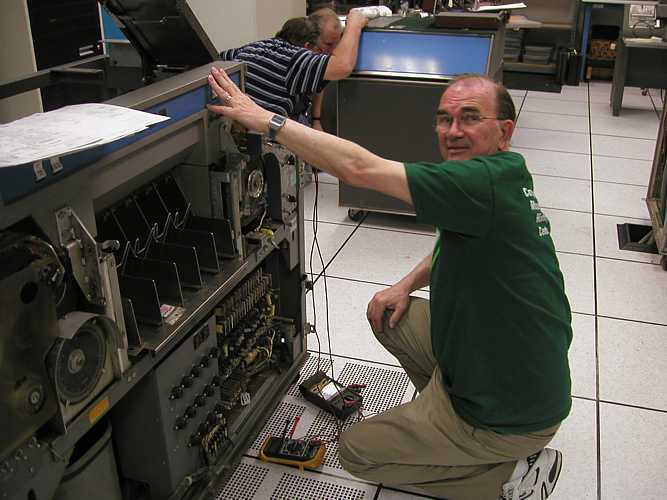 Spares were found on the back of the 1401 operator's console, Dave is researching another source. Don Cull finished timing the rest of the ten Read Latch Circuit Breakers. Ed could not believe that the timing adjustments could be set within the specified +-1 degree - but that was accomplished. Present - Ron Williams and Tim Coslett. Ron circuit and signal traced trying to get the machine to recognize/process the instruction after a two operand instruction completes. 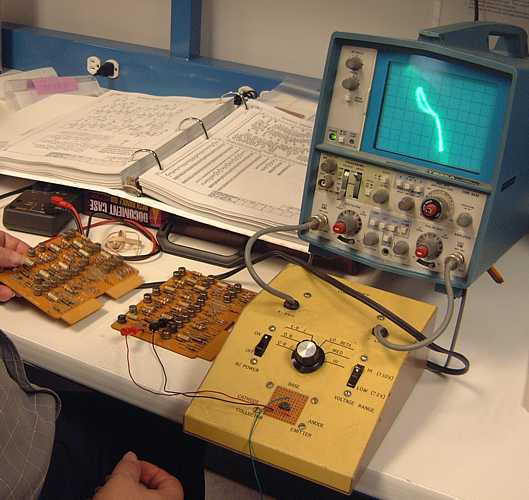 Ron and Tom worked on previously detected bad cards replacing transistors and diodes. Present - Ron Williams, Don Cull, Allen Palmer, Ron Crane, Robert Feretich, Ed Thelen. Ron W. had a good day with the 1401, The machine can now process (not necessarily correctly) multi-operand instructions with out getting lost. Conditional branch instructions work. 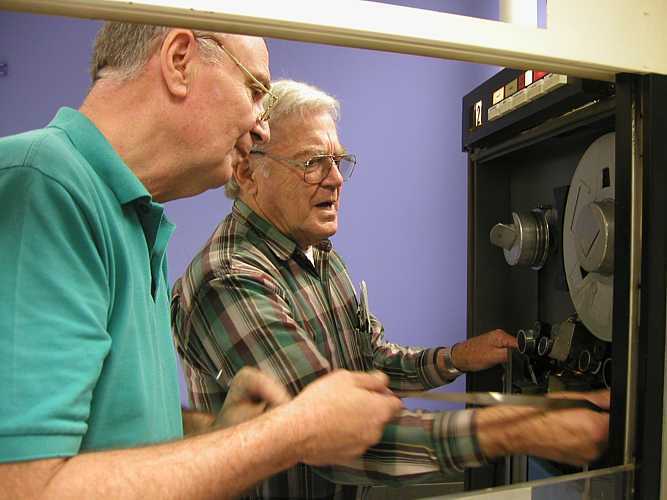 Allen and Don worked on a Mod 5 tape drive, then Allen and Robert F. worked on tape channel logic and timing.